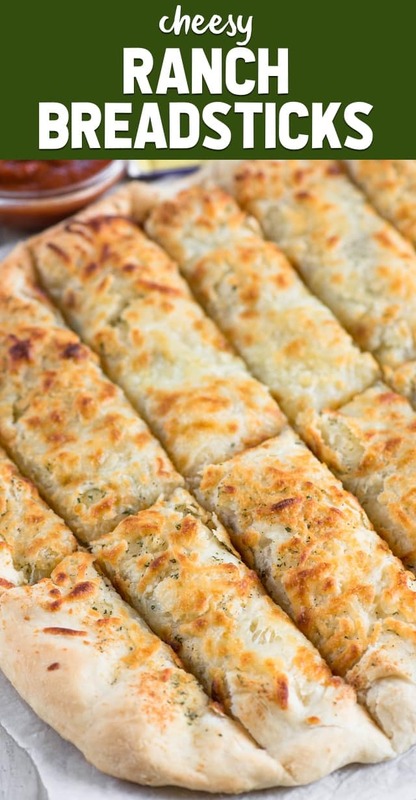 Cheesy Ranch Breadsticks are perfect with any meal. These breadsticks are homemade and full of ranch flavor. 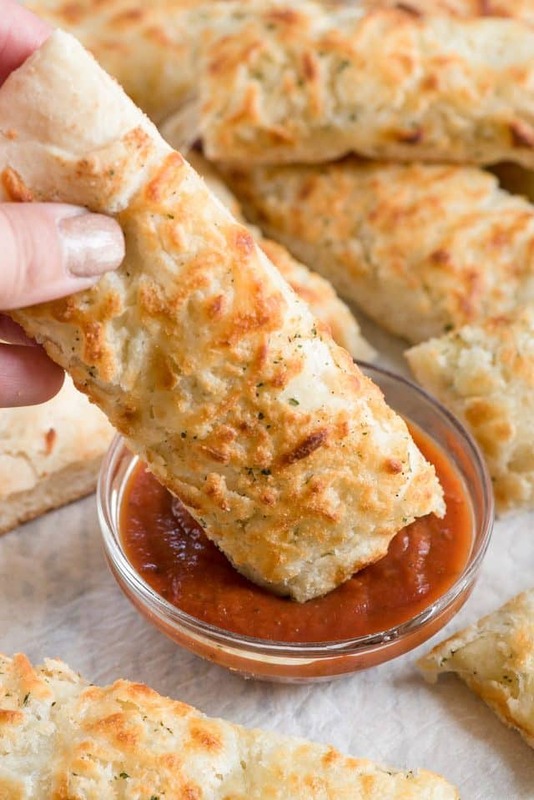 We all loved these easy breadsticks! This post is sponsored by Fleischmann’s® Yeast. Well hello breadsticks; how you doin’? Guys, here’s something (not so) shocking: I love bread. All kinds of bread. Cinnamon rolls, dinner rolls, pizza dough… and breadsticks. I especially love breadsticks when they’re covered with cheese. Up until I started blogging, the only bread or cinnamon rolls I ever had were either from a can or from the store. I’d never used yeast to make bread from scratch; I was super intimidated by it. One day, I took the leap and made homemade cinnamon rolls. I was shocked at how easy it was to use yeast and get a wonderful result – at home, from scratch. It’s been awhile since I made anything with yeast on the blog, so I thought it was time to get back in the game. Cheesy breadsticks are great all year long, but more so as we head into game and soup season. I decided to amp up my cheesy breadstick game with this recipe though. 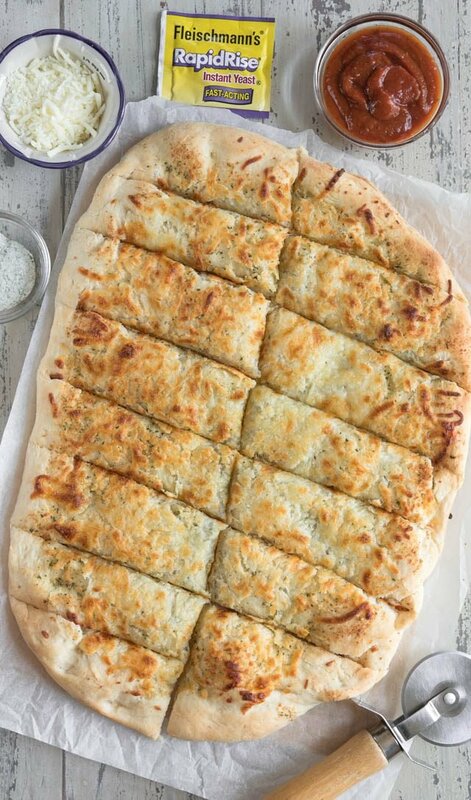 Instead of plain old garlic, I turned these breadsticks into Cheesy RANCH Breadsticks. At first bite, I think I heard angels. Cheesy Ranch Breadsticks are an easy and surprisingly fast homemade breadstick recipe great for any meal! To show how easy it is to bake with yeast, I’m going to walk you through this recipe step by step and give you tips along the way. What kind of yeast should you use for baking? In the past, I’ve always used Active Dry Yeast. Active Dry Yeast needs to be “proofed”; that is, you mix it with hot water and let it get foamy. Recipes made with Active Dry Yeast also often need to do a double rise (like when you’re making cinnamon rolls or bread). For these Cheesy Ranch Breadsticks, I decided to give Fleischmann’s® RapidRise Yeast a try. I’d never used RapidRise Yeast before, but I can tell you it’s the ONLY one I want to use from now on. RapidRise Yeast doesn’t need proofing; you add it with the dry ingredients. Then you add warm water and any other liquids and mix and knead like you normally would. The beauty of it is that, for most doughs, you only have to let it sit 10 minutes before you shape it and let it rest. That’s right: no double rise. Since I used RapidRise Yeast for this recipe, I added it with sugar, flour, and salt in my mixer bowl before adding the wet ingredients. When working with yeast, should you use a mixer or work by hand? In my experience, you can do either. A mixer is just going to shorten the amount of time you spend kneading and mixing. I love using my stand mixer with the dough hook attached. I mix the dough using that, and then let it run until the dough forms a ball. I only have to knead the dough a little bit, and it’s much less messy. If you don’t have a mixer, then stir with a wooden spoon until you can’t anymore, then get your hands dirty. Without a mixer, you’ll just have to knead the dough a little longer. What should the water temperature be when I’m working with yeast? With Fleischmann’s® RapidRise Yeast, you want your water between 120°F and 130°F. It helps if you have an instant read thermometer, but if you don’t have one, just think hot bathwater. Once you’ve added the oil and water, let the mixer run until a soft dough forms. It will be slightly sticky. Turn it out onto a lightly floured surface and knead it until it forms a smooth ball. Once it sits 10 minutes to allow the RapidRise Yeast to work its magic, it’s time to make breadsticks! Simply oil a pan and press the dough into a rectangle. You can make these any thickness you like, using a cookie sheet or pizza pan. These are Cheesy RANCH Breadsticks, so I brush them with a mixture of oil and ranch seasoning mix. If you love the flavor of ranch dressing or ranch on chips, you’ll LOVE the flavor of these breadsticks. And what’s the only thing better than ranch? CHEESE. Lots of gooey mozzarella cheese! Sprinkle that on the top and bake until golden. First of all, these made my house smell wonderful. My mouth was watering by the time they came out of the oven. It was all I could do not to eat them before I took photos. 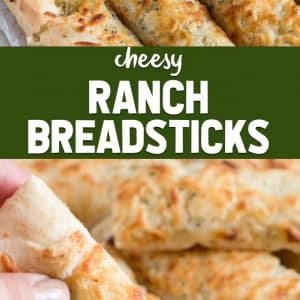 How will you serve these Cheesy Ranch Breadsticks? Alone, dipped in soup, as a side dish to salad or as an appetizer dipped in pizza sauce, these Cheesy Ranch Breadsticks are the perfect way for you to start using yeast. It’s not scary, I promise! Go try it and then share on Instagram with #crazyforcrust so I can see your adventures in yeast! 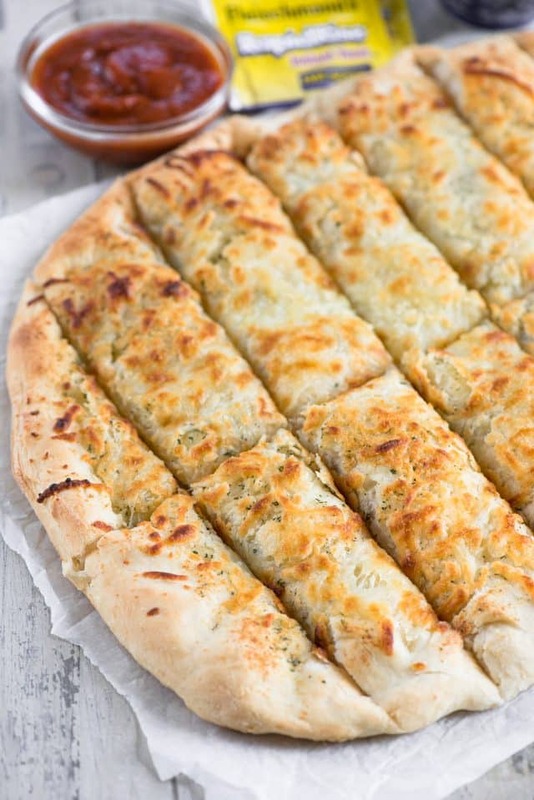 This recipe is slightly adapted from this Garlic Cheese Breadsticks recipe. Cheesy Ranch Breadsticks are the perfect side dish for any meal. They're a homemade breadstick topped with ranch and lots of cheese! You can use a wooden spoon and do it by hand or use an electric mixer fitted with the dough hook. 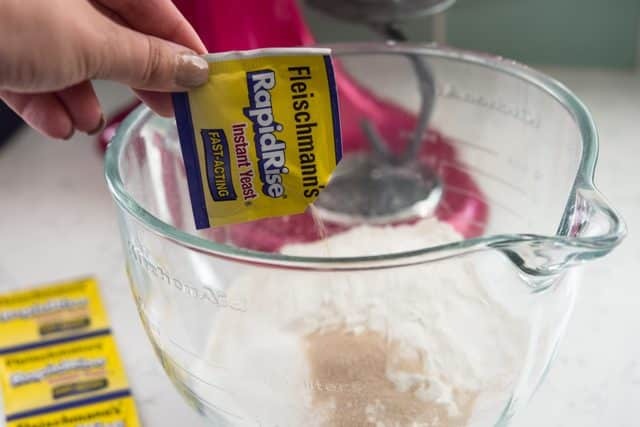 Combine 2 cups flour, undissolved Fleischmann's® RapidRise Yeast, sugar and salt in a large bowl. Add very warm water and 1/3 cup oil; mix until well blended, about 1 minute. Slowly add enough flour to make a soft dough. Dough will form a ball and be slightly sticky. Turn out dough onto a floured surface and knead the dough, adding additional flour as necessary, until the dough is smooth and elastic. This will take just a minute if you used an electric mixer, about 4 minutes if you're doing it by hand. (To knead the dough, add just enough flour to keep your hands from sticking. 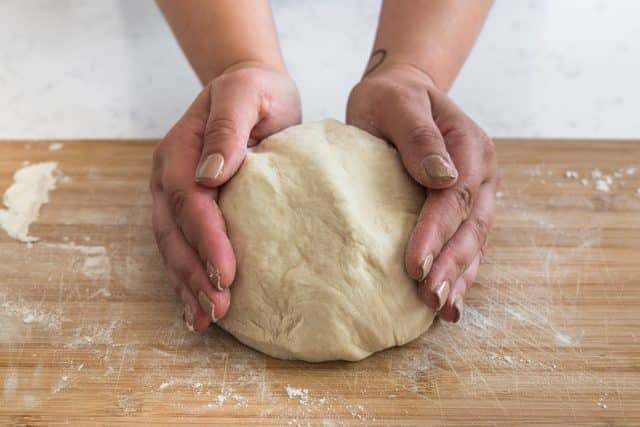 Flatten the dough and roll it towards you; using the heels of your hands push it away in a rolling motion. Rotate and repeat until a soft and elastic dough ball forms. Drizzle the bottom of a pan with a bit of olive oil. Pat dough with floured hands to fit a pizza pan or baking sheet to desired thinness. Stir together 3 tablespoons olive oil and ranch seasoning mix. 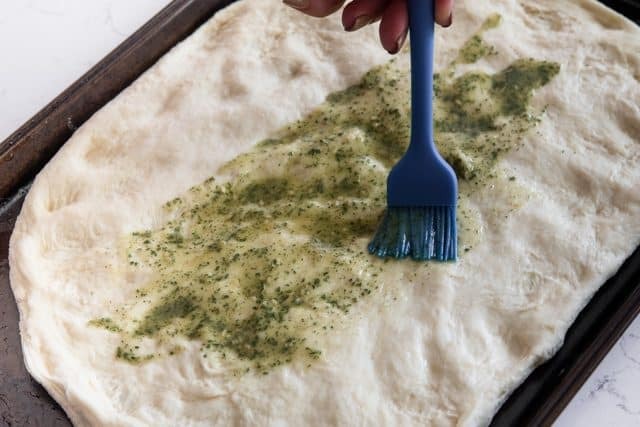 Brush all over dough. Top with cheese. Bake 15-25 minutes or until golden and cheese is melty. Baking time will vary depending on how thick or thin you roll your dough. 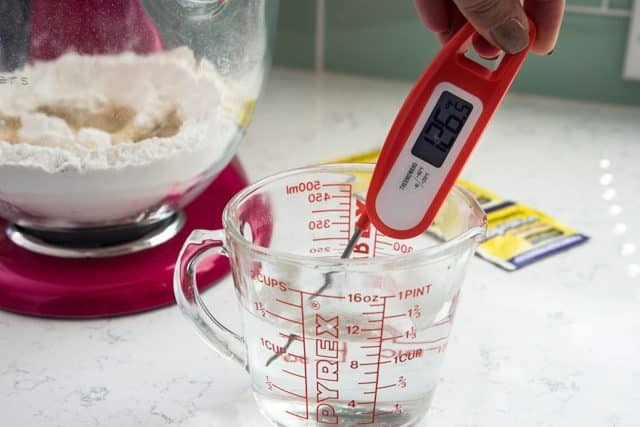 If you don't have a thermometer to test the water, think hot bathwater. The water should be very warm to the touch. These breadsticks would go well with Clam Chowder Soup or Potato Leek Soup, or as a side dish to my Apple Salad. This post is sponsored by Fleischmann’s Yeast. All opinions are 100% my own.